Nestlé has released two new limited-edition gingerbread-flavoured products in the UK in time for Christmas. 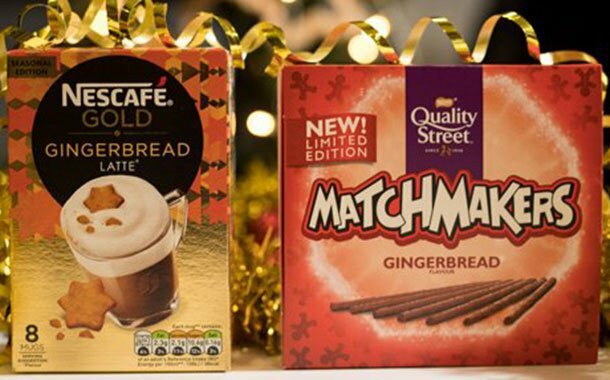 The Nescafé Gold Gingerbread Latte and the Gingerbread Matchmakers by Quality Street have been released to cater to the enduring demand for gingerbread-flavoured products from consumers in the UK. To make the Nescafé Gold Gingerbread Latte, consumers add hot water to create a “delicately spiced” latte which has a warming gingerbread flavour. Meanwhile, the new Matchmakers feature chocolate sticks full of a crunchy blend of milk and dark chocolate with a gingerbread flavour, and the sticks are free from artificial colours, flavours and preservatives. Taka Ota, Nescafé senior brand manager said: “Our Gingerbread Latte first debuted as a limited edition back in 2013, but this year its back for another limited run after popular demand! Rebecca Holt, Quality Street brand manager said: “Nestlé likes to move with seasonal trends and recipe innovations so it was only right we brought our latest limited edition to UK consumers in time for the festive season! Quality Street Gingerbread Matchmakers are now available exclusively at Tesco stores, while the Nescafé Gold Gingerbread Latte is available in the coffee aisle from selected retailers across the UK.